Poets, novelists, painters have described Montefalco, Spoleto and the springs of Clitumnus. This territory has also an ancient tradition in winemaking, dating back to the Etruscans, and still alive in great wines like Sagrantino. Our journey continues to Spoleto and Valnerina, and then to Nursia, one of the shrines of Umbria’s gastronomy. 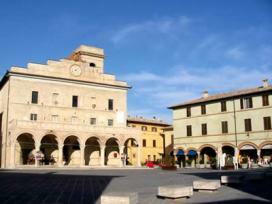 Montefalco. Gentle hills, vineyards, olive groves, rural traditions. Montefalco invites to a slow pace: celebrated as “the terrace upon Umbria” for its wide landscape, it retains its Medieval structure, with city walls, steep alleys, ancient buildings and traditional workshops, including several wine shops. Among its many qualities of wine, we recommend Sagrantino di Montefalco Secco and Passito, Montefalco Rosso and Montefalco Bianco. In the Church of San Francesco, the frescoes by Benozzo Gozzoli (1450-1452) are one the earliest works by this painter. In the church of Sant’Agostino, a shrine displays the body of the Beato Pellegrino, who, according to a legend, was a pilgrim who died in Montefalco and whose corpse is still perfectly preserved, after centuries. Trevi and the springs of Clitumnus. After few more than 6 miles (towards località Polzella, via Casco dell’Acqua, via Pietrarossa in Borgo, via Madonna, Trevi),we get to Trevi, included among “Italy’smost beautiful towns”, and also famousfor his fine olive oil. A 3 miles’ trip (viadel Priorato, via Sant’Egidio) leads us tothe Springs of Clitumnus, a crystal-clearpound surrounded by cypresses, poplarsand willows, whose enchanting beauty wascelebrated by Vergil, Pliny the Younger, George Byron and Giosuè Carducci.Nearby, an interesting Roman temple.1 mile from Trevi (towards via dellaCostarella), the small town of Bovarahosts the Abbey of San Pietro, one ofthe finest examples of Umbria’s XIIICentury’s architecture. Spoleto. We advice to enter in Spoleto through Piazza San Domenico, with the Gothic church of the same name, and then to explore at a slow pace the maze of alleys, squares and stairs, which characterizes its city center. The Cathedral of Santa Maria Assunta, one of Italy’s most famous Romanesque buildings, was erected in XII century, and later reworked several times till XVIII century. The interior looks like a jewel case, with frescoes by Pinturicchio and Filippo Lippi, a Byzantine mosaic and a Medieval crucifixion. A walk across piazza Campello leads to the imposing Rocca di Albornoz, built in 1359, and to the spectacular Ponte delle Torri, built in XII Century, 300 feet high and 780 feet long, connecting the hill of Sant’Elia with the mountain of Monteluco through ten majestic arcades. Other visits we recommend are the church of San Pietro Fuori le Mura (V Century), the Roman Theatre near Piazza della Libertà, the Roman Ponte Sanguinario, the Arch of Drusus (23 BC) and piazza del Mercato, where the ancient Roman stood. In front of the railway station, a fascinating installation of Alexander Calder, entitled “Teodelapio”. Just outside the city walls, the church of San Pietro and the monastery of Sant’Agata are also interesting. In the suburb of Monteluco, there is a hermitage where Saint Francis dwelled in 1218. Valnerina. Leaving Spoleto, we head towards Valnerina (SS 3 towards Eggi, SS 685), in a landscape marked by hermitages, karstic streams and the remains of ancient Roman roads. In Sant’Anatolia di Narco, the wonderful Abbey of Santi Felice e Mauro has also fifty rooms to offer reception to the travellers. After 4 miles (SS685 towards Castel San felice), we reach Vallo di Nera, through a steep and windy road surrounded by greenery. Its quietness and its overlook over Valnerina are extraordinaly fascinating. The town is perfectly preserved, looking like a Medieval fortress. The church of Santa Maria di Valle is finely frescoed. Heading towads Cerreto di Spoleto through SS 685, we get to the Hermitage of Madonna della Stella (località Rocchetta), entirely built in the locale stone, directly upon the rocks and the river Tissino. Our last stop is the Abbey of Sant’Eutizio, near Preci, famous both for its Romanesque architecture and for having been the birthplace of one of the first school of eye surgery, in the Middle Ages. A 12 miles’ trip leads us to Nursia and to the National Park of Monti Sibillini.